RUSSIA and CHINA - The current hog price in Russia is 111 rubles per kilogram or $0.80 USD/lb liveweight. Profits per head should be $60 USD, writes Jim Long President – CEO Genesus Inc.
Russia is on a quest to be self-sufficient in pork. They also wish to begin exporting to China large volumes of pork. To maximise the exportation of pork, African Swine Fever Disease (ASF) must be stopped. There are still ASF outbreaks happening with some large scale operations. When this happens, all pigs are killed. The Russian government announced recently their desire to eliminate the disease. This is a difficult and challenging job which could lead to strict rules on how pigs are raised, meaning backyard pigs could eventually be eliminated. Backyard pigs are still a major contributor to Russian pork production tonnage. Their elimination through government imposed pig raising rules could delay Russia’s timeline to self-sufficiency. We believe that there is currently an estimated 450,000 new sow spaces being built or seriously contemplated in Russia. These are privately being done by te largest producers. The cost of establishing pig production is expensive in Russia. There is no contracting of production. Consequently, all facilities are built by the producers, including swine inventory, all swine buildings, feed mills, and even packing plants. This takes a lot of capital. Our estimate of this cost is $13,000 per sow (ie. 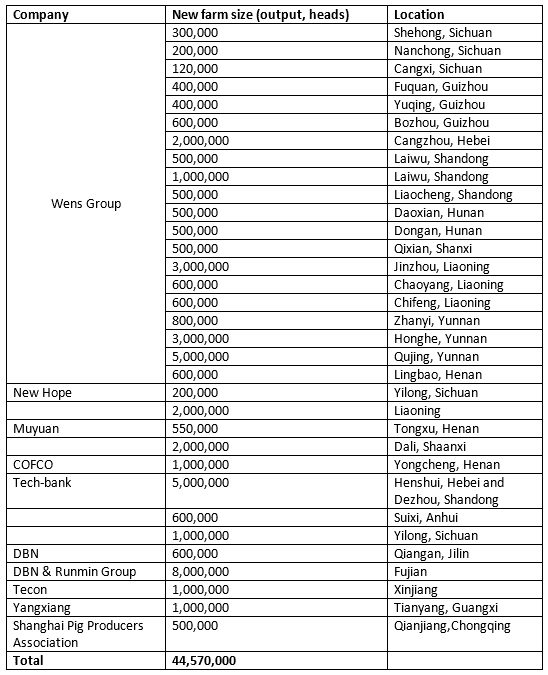 50,000 sows equals $650 million USD). This is a huge investment that only large enterprises can undertake to acquire the necessary capital. The Russian pork industry has benefited recently from the sanctions that have kept European and North American pork from being imported. The main source of Russian imported pork is Brazil, which has sent 159,300 tons to Russia from January – August (up 4% year to date). Russian swine producers are currently benefitting from plentiful feed availability due to Russia having its largest grain harvest on record. The swine industry has gained much in technical and business acumen over the last ten years. It is now a sophisticated and knowledgeable industry. New packing capacity of approximately 6 million hogs a year is either under construction or in the works. We see Russia continuing to expand. Most of the production will end up in the hands of a few companies. Profitability always increases production and Russia continues to be profitable. The large amounts of capital needed due to no contract production slows down expansion. Our take home message to our North American and European readers: Don’t build a business plan on sending pigs or pork to Russia. Russia will look after itself. China has enjoyed very profitable prices for the past year. The current hog price is 17.94 CNY/kg liveweight or $1.31 USD/lb liveweight. Most producers should be making $100 USD per head. Recently, it was as high as $150 USD per head. All these high prices are due to the liquidation of the Chinese sow herd resulting from the financial losses of up to $80 per head 2-3 years ago. There is a hog cycle in China too! Liquidation of sow herd was not only triggered by financial losses, but from the migration of rural people to urban areas. It is estimated that 20 million rural Chinese are moving to cities yearly, the largest migration in the history of the world. Many migrants had small farms. They had small farms and they had pigs, and when they go to the city, they go out of pig production forever. In China, there is expansion. When we see a list of potential expansions by major producers, it amounts to 44.5 million hogs. That’s almost half of U.S. production. Like all plans, some will come to fruition, but some will not. There is no doubt China is a huge consumer of pork. As incomes rise in China, the question is whether consumers will eat more pork. If they do, the sheer number of 1.4 billion people eating more pork is a huge amount. 1kg more on 1.4 billion people would be double Canada’s total pork consumption. You need to look no further than China’s WH Group that owns Smithfield Food. It appears their strategy is to produce pork in USA, Mexico, Poland, and Romania, and export the pork to China. At this point, China’s WH Group does not look like its scheme is to produce pork in China. They are betting big time that China will need imported pork for a long time. Other issues facing the Chinese industry is the disease exposure that leads to increased swine mortality. From our experience, China has more health challenges than any other country we work in. This limits production and increases cost. There is no simple solution for this dilemma. New environmental regulations are tightening significantly. There are new rules for manure disposal. It is increasingly more difficult to get permits to build new barns. This will slow the rebound expansion. $100 USD per head profits is leading to herd expansion in China. We get concerned when we hear in our travels that expansion of swine production and packing plants is to supply China’s market. It might work. The wild card is what China’s consumption will be? And what is China’s own pork production going to be? We are not smart enough to know either answer. The only thing we can say is let’s hope China keeps eating lots of pork.